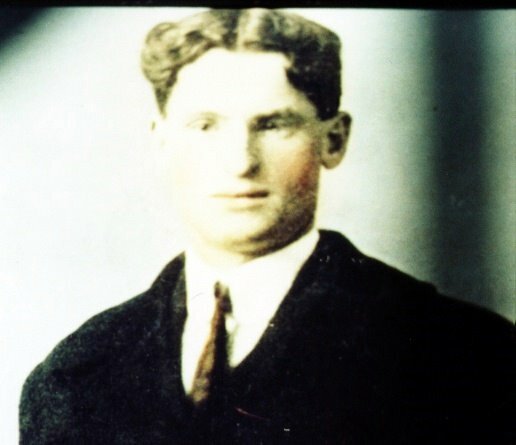 My great-grandfather, John Rory MacLeod, was born in July 1889 in Upper South West Mabou, in the district of Glencoe, Cape Breton, Nova Scotia. Like his uncle Hugh Duncan and his brothers John ‘Mor’ and Duncan, John R left Cape Breton in search of a better life. He worked as a lumberjack in New Brunswick’s forests, then, like his brothers, worked the mines in Ontario. Later he ventured up into the Yukon. The great Klondike gold rush had long since ended, but there was still gold to be found and fortunes to be made, and the Yukon was still a very rough-and-tumble place. According to my grandfather, John R carried a revolver on each hip during his time up north. Fortune eluded John R, however, and he returned to Cape Breton, where on 12 April 1915 he married Mary Gillis, daughter of farmers Archibald and Mary Ann Gillis of Grand Mira. John R and Mary had two children, a son named Donald and a daughter named Jessie, and John R did his best to make a living to support his small family. He briefly worked as a fireman, but he was fired when his superiors learned he was blind in one eye. I’m not sure if he was born that way, or if he was injured during his time working away from the island. I suppose the reason didn’t matter at the time. John R was out of a job. Lucky for him, the Dominion Iron and Steel Company was always looking for labourers. Life had more tests for John R, though. Only a few years into his marriage, his wife Mary died of cancer, leaving him to care for his children and his mentally-challenged brother-in-law, Big Jim. John R soon married again, this time to Susan Powell, from the small island of Fogo, Newfoundland, daughter of Eliza Leyte and a fishing boat captain named Nathaniel Powell. John R and Susan welcomed their first child together on 22 November 1927 in the house they lived in on Townsend Street. It was a boy; they named him Duncan, after John R’s brother. Duncan MacLeod, my grandfather, has happy memories of his father. He told me he had to read the Saturday morning paper to his father because John R was illiterate. Duncan — Papa — would even read the little speech balloons as he and his father looked at the comics. Papa told me his father had a fiddle and claimed to know three tunes, though he only ever played one, Red Wing (here’s a video of someone playing that tune). Something else Papa remembers about John R is that he and Susan never fought, never argued at all. Papa only ever saw his mother, a very quiet person, get angry at his father once. It was just after a blizzard, and John R had left the house to make the long, difficult walk to the steel plant to shovel snow. He’d been gone a long time but suddenly reappeared at the door. When Susan asked him what he was doing home, he said he’d got halfway to work when a drunk asked him for money; he didn’t have any so he’d come home to get a quarter. That was the only time Duncan MacLeod ever saw his mother get angry at his father. John R and Susan had several more children and, though every extra mouth to feed meant life would be more difficult, they were happy. But at the beginning of June, 1937, all that came to an end. John R was walking home from work on June 1st when a truck carrying a full load of hot slag (the stuff left over when coal is burnt) lost control and crashed, dumping its contents right on top of him. He suffered horrific burns from the waist down and was rushed to the hospital. His boss sent someone to his home (at the time the MacLeods were living in a 2nd-floor apartment on Intercolonial Street) to tell Susan that John R had had a “little accident”. Susan was told there was no need to go to the hospital. The next morning, however, Father MacGillivray came to see Susan and told her she needed to go to the hospital right away. When Susan got to the hospital she was told she could talk to her husband but couldn’t look behind the curtain that was draped between them. So she sat and talked with John R, who asked her if the children were okay. “Make sure the boys are in by seven,” he said to her. Then he died, just as the church bells were ringing at noon. John Rory MacLeod was just shy of his 48th birthday. Life was hard while John R was alive; now that he was gone, Susan and her children were about to find out just how hard it could be. But that’s a story for another day.